Home / Search by Media Type / 12 " / A MUSIC SAMPLER OF THE STATE OF THINGS LP. Beggars Banquet 1985. Alternative Rock compilation. The Cult, Ramones. s.
Track A1 taken from the album (BEGA 61) ‘The small price of a bicycle’. Track A2 taken from the forthcoming album (BEGA 69) should the world fail to fall apart’. The version used is not the Album version, but a Sampler version(source: Complete PM Directory). Track A3 taken from the album (SITU 14) ‘Immigrant’. Track A4 taken from the album (BEGA 68) ‘Artificial Intelligence’. Track A5 taken from the album (BEGA 66) seventh dream of teenage heaven’. Track A6 taken from the forthcoming album (BEGA 70). The album is not mentioned on the release. The track appears on the album ‘Animal Boy’ under the title ‘My Brain Is Hanging Upside Down (Bonzo Goes To Bitburg)’. Track B1 taken from the album (BEGA 65) ‘Love’. Track B2 taken from the album (BEGA 67) ‘This nations’ saving grace’. Track B3 taken from the album (BEGA 63) ‘Camera obscura’. Track B4 taken from the double album (BEGA 64) ‘1979-1983’. Track B5 taken from the mini-album (SITUM 15) ‘Giants’. Track B6 taken from the album (SITU 16) ‘Rodeo radio’. Track B6 ‘Never Wear Mascara’ is titled as ‘Never Wear Mascara (When You Love A Married Man)’ on the label. 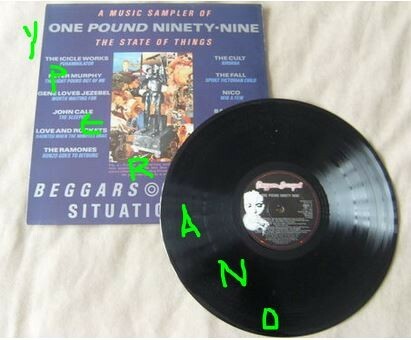 SKU: YP-2640 Categories: All Genres, Punk-Ska-Oi-Punk Rock, Rock, Search by Media Type, 12 "